It happens all the time. Just when a washed-up old Rock God looks done for good, he announces a comeback and returns to the stage in all his glory. When Activision called time on the multi-platiumum career of the storied Guitar Hero franchise earlier this year, most people thought (video game) rock was dead. But it appears, in true rock 'n' roll tradition, the game is just taking a year off the road to recuperate and get off the smack, man. Activision president Dan Winters told industry publication gamesindustry.biz that, rather than retiring, the franchise was simply on hiatus and will be back on stage, perhaps as soon as next year? "Just to clarify," he said, "we're just putting Guitar Hero on hiatus, we're not ending it. "We're releasing products out of the vault--we'll continue to sustain the channel, the brand won't go away. We're just not making a new one for next year, that's all." The news is a far-cry from the company's announcement back in February, when it told the gaming world that it was "disbanding" the franchise due to poor sales. So it looks like the band just got back together. 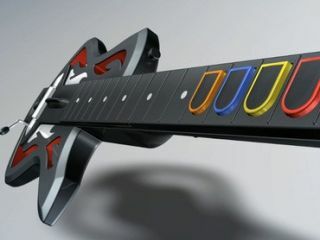 Are you ready for Guitar Hero: The 2012 Comeback Special?